Home » Articles » 159. Are You Afraid of Expressing Your Anger? 159. Are You Afraid of Expressing Your Anger? Many adults learned as children not to get angry, they learned to prevent arguments. Keep quiet. Swallow it. Because if you get angry, there’s a chance that it will cause an argument and you won’t be strong enough. So, repress your anger. Don’t argue! The adults who taught this to children are the ones who are always nice, keeping the peace. The cloak of love…. they are very good at keeping themselves under control. They feel that there has been some kind of injustice, but quickly move on past what they want themselves. Because otherwise, there will be an argument! And they repress their anger; they keep it inside. How did things go during puberty? This is the moment that you became stronger as a child and you could open your mouth. The moment that you could disagree, in which you could stick up for yourself. Did you do that? Did you rebel? Did you drive your father crazy? Did you yell at your mother, all the way from the tips of your toes? It’s no fun, but it is necessary. As a young person, it is necessary for you to feel what it means to be angry and to express your anger. That is often unfocussed, but you need to feel what it means to be angry and to express it. You need to experience that strong energy and see that you have influence on other people because of it. It’s up to parents to realize that this is part of growing up and that they can be proud of you for sticking up for yourself. People who never get angry are deceiving themselves. Everyone gets angry once in a while. If you decide not to vent your anger, it will tax your body. Your liver and gall bladder can suffer from this. Repressed anger causes illness. Expressing your anger is much healthier, but then in a way that is acceptable to the people around you. We need to take a look at anger. I wrote an article about this, article 15 ‘Angry? Wear Your Heart on Your Sleeve!’. If you take a look at anger, you realize that there is something wonderful about it and that there is strength in it! And, have you been feeling angry more often? Feel the enormous energy it contains. I am often grateful to angry people! They bring about change! If you do the 9 steps of the MIR-Method, your subconscious works in many ways to free you. In article 15 I described what happens, step-by-step. You begin to feel as you were intended to, according to your original blueprint. And that means that you will be faithful to your emotions, including your anger, because that is the gauge that something is not going the way you’d like it to. By doing the MIR-Method, you become more in touch with what you would like, with what is important to you. If you never get angry, it’s possible that you will become a bit crabbier, a little crankier and sometimes explode. No fun but necessary because you are beginning to feel that something needs to change and that you no longer accept the way it is now. Super! Have you also noticed that you become angry more easily since doing the MIR-Method? That you don’t always just want to keep the peace anymore and that you are shortchanging yourself when you do? I’d love to hear about it! Please write about it below. Thank you! My wish is that you can enjoy the strength of the power hidden behind your anger! P.S. You would do me a big favor by spreading the MIR-Method to others by posting this article to your Facebook page or forwarding it via e-mail, Twitter or Linked-In! Use the icons on the left-hand side! Thank you! I have been using the MIR method everyday for about 4 months and don’t plan to stop. I’ve been hearing for years that I should learn to “parent” myself to make up for childhood emotional losses and I always resisted this idea. I feel I have a right to want to have my needs met even if some of this stems from childhood and I can not go back to these formative years. 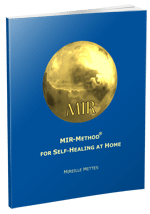 When I started using the MIR method I immediately realized that this is a form of self-parenting or caring for myself that I can do for myself rather than going outside myself for comforting and love such as with acupuncture, massage, etc. So, when I began seeing changes in my life I was thrilled that I have this tool to use whereever I go. As a child of much unpredictability in my past, this is one routine that helps ground me morning and evening, more so than brushing my teeth although done around the same time. Thank you for this deepening tool into my inner self and inner resources that I knew I always had. Your method is yet another way to feel that “unity” that you said was your mission. I feel more connected with my emotions, my bodily sensations, my right to be here, and my love for humanity as I practice your method. How wonderful how you -spot on- describe what I intended for anyone. So glad you embraced the MIR-Method and can see it is a tool for life! Am very happy it helps you to fulfill all that you missed out as a child, so you can heal yourself, totally independant from others. Great! I never was good at expressing my anger getting a bit better at it the older I get as leant if one represses anger and other feelings of resentment they build up and once in a while explode usually over something minor and than over reacts which is sometimes worse than just getting angry, I have also found the reaction from others to normal anger is never as bad as one thinks it will be. so the MIR-Method is good probably thinking of the situation that makes you angry while doing the MIR-Method works in similar way to EFT and combining with EFT is probably even more effective. I’ll give it try and let you know. Hope you will find some lovely anger in you! Beneath that anger is something your heart really wants to express. I am curious what it is!